Using Podcast Mirror with SoundCloud is simple. All you need is your podcast feed’s URL. 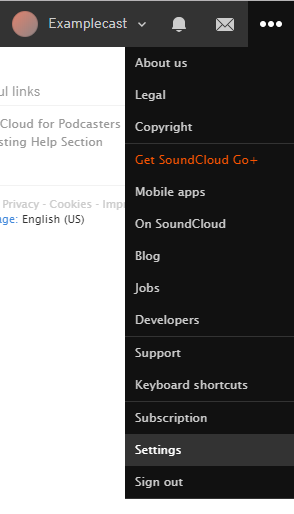 If you aren’t sure where your feed is located, you can find it easily in the Settings of your SoundCloud profile. Once you’ve logged into SoundCloud, click on the three dots on the far right of the bar at the top of the page. Near the bottom of the menu that appears, click Settings. From here, select the Content tab. You should see a text box labeled RSS feed. This is your podcast feed. You can now use this URL to add your feed to Podcast Mirror. Once you have added your feed to Podcast Mirror, be sure to update your podcast listings to this new location! You can find more information on updating your podcast directories here.